In Trier, Daniel Deckers, political editor of the Frankfurter Allgemeine Zeitung and wine author, gave an excellent presentation of Im Zeichen des Traubenadlers (The Sign of the Eagle, von Zabern, 2010), his new book about the history of the VDP. Many of the noted and senior members of the Grosser Ring, such as Egon Müller and Manfred Prüm of Joh. Jos. Prüm, were in attendance on September 28, 2010. In addition, several estates kindly provided their Rieslings—primarily fruity Kabinetts from the 2009 vintage—to taste before and after Deckers’s lecture, including some very good wines from Joh. Jos. Prüm (2004 Wehlener Sonnenuhr Riesling Kabinett), Schloss Lieser, Zilliken, von Othegraven, and Clemens Busch, the latter the lone dry Riesling called "vom grauen Schiefer" (from gray slate). Although I’ve yet to finish reading Deckers’s book (In the sign of the eagle), much of its focus is on the Mosel as well as Trier, an important center for wine merchants and auctions in the mid- to late 19th century. It was only right to have his presentation with slide show take place in the municipal library of Trier. 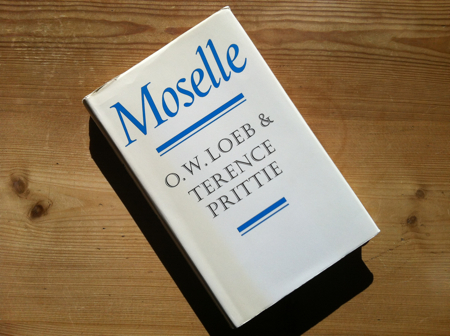 One out-of-print book that Deckers highlights is Otto Wolfgang Loeb and Terence Prittie's Moselle (Faber and Faber, 1972). O.W. Loeb, who emigrated from Trier to London in 1937, established a leading wine merchant house, and Terence Prittie was a well-known British wine journalist. Their book was dedicated to the memory of O.W. Loeb's father, Sigmund Loeb (1859–1950), an esteemed wine broker and President of the Mosel Wine Trade Association from 1903–1930. On old black-and-white photographs, Sigmund Loeb is easily recognizable with his long beard, as most gentlemen wore mustaches at the time. Deckers writes that Moselle not only pays homage to an important personality of German wine in the first half of the 20th century, it is also a passionate and informative account ever to be given to a German winegrowing region—and then from a German Jew who was dispelled by the Nazis. O.W. Loeb eventually returned to Trier in the beginning of 1974, where he died a few months later. He was honored with the highest national and city decorations and buried in the Trier main cemetery. His father and mother had fled to Holland in 1938 (one year after O.W. Loeb and his sister left to London) and survived detainment in the Dutch Westerbork concentration camp. Sigmund would live until he was 91 years old. Loeb & Prittie’s Moselle begins with the early history of the Mosel wine region and then the history since 1800. It looks at “where the wine is grown” (that is to say, the different subregions, such as the "Upper Moselle and Saar"), before going on to grape-growing, winemaking, terminology, vintages, trade, plus the future outlook up until the 1971 Wine Law. As one can imagine, the book gives the reader a wealth of insight, even if some of the authors’ opinions are questionable. In 16th-century England, the Mosel was commonly “lumped in with ‘Rhenish’ [Rhine] or ‘German’ wines.” According to Karl Heinrich Koch’s Moselwein, printed in 1897, it was even normal in the 1860s for merchants, based in Mainz, to blend Mosel with Rhine wines. “As far back as 1750 the Elector of Trier had issued a decree that [Mosel] wine should be naturrein, or totally ['naturally'] pure.” Despite the northerly clime, the Mosel Valley as well as other regions of Germany, such as the Haardt Mountains (Pfalz), have a long tradition of non-sugared wines. In later years, this remained an important and contentious issue for many producers. The cool Saar region, of all places, had a number of purists who were particularly dogmatic about sugaring. In general, chaptalization and adulteration of wine were widespread, especially in France and Italy. The appellation “Mosel-Saar-Ruwer” was officially introduced in the 1930s. “The two qualities which distinguish an ordinary Moselle in an ordinary year are its freshness and its dryness. These are the two qualities which Restsuesse can take away—giving the wine a flat sweetness and removing the wine’s dry and elegant finish.” The Mosel’s trademark is quaffable wines with pronounced acidity and delicacy, instead of sweetness. In Hugh R. Rudd's Hocks and Moselles, first published in 1935, he writes "The Moselle wines in general have the same elegant, clean, dry and gay characteristics, but they vary a good deal according to the areas from which they come." “Cabinet [later to be termed 'Kabinett' by the 1971 Wine Law, although old spellings had 'Kabinett,' too] should have been discarded from the wine vocabulary of the Moselle.” The authors point out that Cabinet was a traditional Rhine term for reserve bottlings and had nothing to do with Mosel wine. “Organized late pickings are a fairly recent development, and experts agree that the term Spaetlese was not known before 1910, and was not in general use before the 1920s.” Spätlese, however, was used before 1910, but more as a term for harvesting than as a label designation. Vineyard names were rarely used for German wines before the mid-18th century. “The reason for the absence of a well-defined trade in Moselle was quite simply geographical.” Unlike the Rhine regions, the Mosel Valley was difficult to reach. In K.H. Koch’s Moselwein, he writes that the completion of the Moselle line, in 1879, helped Mosel wine become fashionable in Germany. Deckers writes, too, that the Prussian state rail line, between Koblenz and Trier, was one of the factors that made "Moselwein – Modewein." “The Freiherr von Schorlemer’s cellar-master [one of the top Mosel/Saar estates at the time] had refused to bottle the 1920’s until 1928, believing that refermentation in bottle had to be avoided at all costs.” The local cognoscenti enjoyed drinking mature cask-aged Mosel wines. Wines from the 1920s were typically aged for two or more years in Fuder—a style somewhat different from today’s Mosel Rieslings, which are usually bottled the following spring or summer after the harvest. Nonetheless, most Mosel wine was ready to drink after bottling and appreciated for its delicacy and freshness. An earlier version of this post appeared on the blog of the former Mosel Wine Merchant, November 9, 2010.